You may think from my absence on this blog that not much cooking has been happening in our kitchen. Quite the contrary actually. If you follow me on Instagram you have probably seen what I've been up to in the kitchen. Correction- what we have been up to. With Maryam off from school, baking and cooking is a great way to entertain and keep her busy- she ALWAYS wants to help. We have made orzo salad with arugula and sweet cherry tomatoes, soft doughy bread rolls, home made pizza with the most flavorful and easy tomato sauce ever. Must share that one soon. 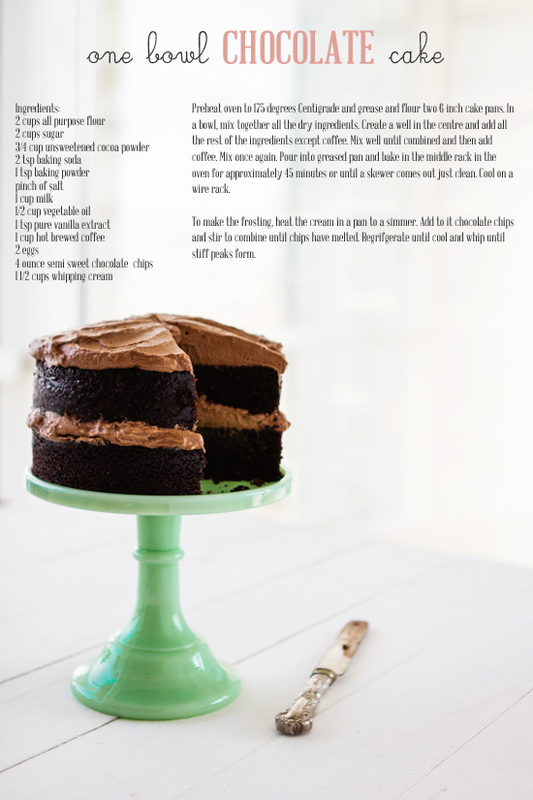 This one bowl chocolate cake has been a favorite. I cannot tell you how many times we have made this cake over the last few months. July and August is a busy month for us when it comes to birthdays and other celebrations. A total of eight I think. Yes, and our anniversary too. Eleven years married. And so a celebration cake is always sitting on our counter, more than likely chocolate. After all it needs no season right? Moist, easy, no hassle and little clean up. Simple, yet always looks like so much effort went into it. I like to top it with some chocolate whipped cream for special occassions but it works just as well topped with fresh berries and powdered sugar. 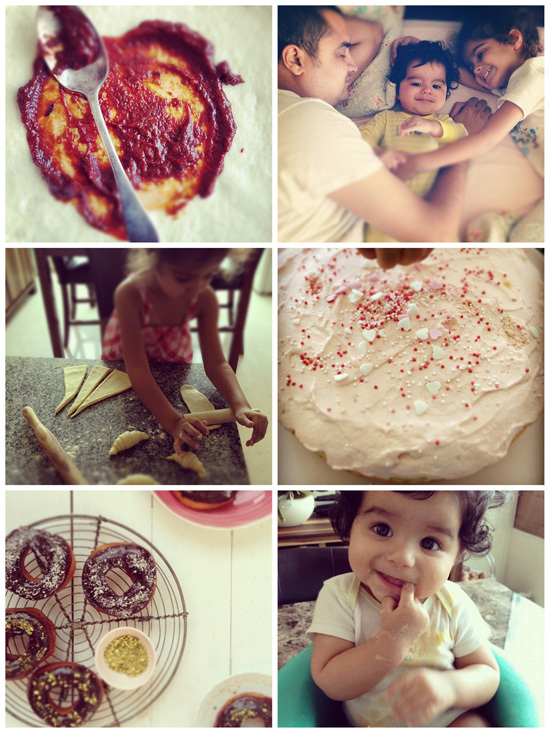 Even though I have blogged about this recipe before, it was Maryam who prompted this post. 'Mamma, why are you not taking a picture of the cake?' And I thought, why not. 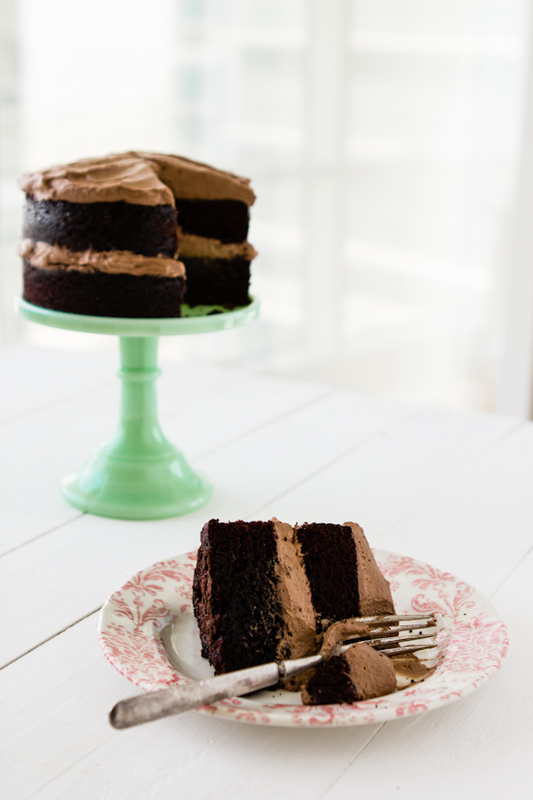 Even though this cake has graced the blog, sometimes there is nothing like on old favorite. Something comforting, like a soft old blanket. Weathered, frayed at the ages, used a multitude of times but cocoons like no other. And that is exactly what this cake does. Preheat oven to 175 degrees Centigrade and grease and flour two 6 inch cake pans. In a bowl, mix together all the dry ingredients. Create a well in the centre and add all the rest of the ingredients except coffee. Mix well until combined and then add coffee. Mix once again (the batter will be very runny). Pour into greased pans and bake in the middle rack in the oven for approximately 45 minutes or until a skewer comes out just clean. Cool on a wire rack. To make the frosting, heat the whipping cream in a pan to a simmer (do NOT boil). Add to it chocolate chips and stir to combine until chips have melted. Regrifgerate until cool and whip until stiff peaks form. Cream will not whip if boiled or if not completely cold before whipping. Looks devilishly decadent! I fall more in love with your props with every post. Just lovely. 1. Use normal sugar? Or icing? Or granulated? Or crushed? 2. How to brew the coffee? Like take a cup water and add a sachet of coffee? And the whipping... What do I whip the cream with? Fork? Blender? Help! A fabulous cake! So delicious looking. I love that method/recipe. Holyzatanxgirl- Use normal sugar for the cake. Brew coffee as normal- say just over 1 cup of water boiled with 1 tsp of coffee. I bend the whipping cream by hand using a whisk. You had me at "one bowl." My biggest gripe about baking is that I always end up with a big ole' pile of dishes in the sink and flour everywhere! Any cake batter that uses one bowl is a keeper in my book! Beautiful cake - so decadent. Beautiful! (And one-bowl cakes are just about the only kind I'll venture to make...) It's so cute that your daughter knows that you usually take photos of your professional-looking kitchen creations! Looks perfectly delicious- I love that you did not cover the whole cake with frosting! Absolutely lovely - the cake, the update, the images... happy Summer! I am a little confused about the frosting.. When you say heat the cream.. Which cream are you referring to ? Hi Anonymous- I mean the whipping cream cream whoich is the last of the ingredients. ohh, what a gorgeously lovely post! your children are such stars - totally beautiful. Hi Selle- I hve only ever used whole milk but to be honest, I'm sure it would work just as well with low fat milk. The cake is so moist!! 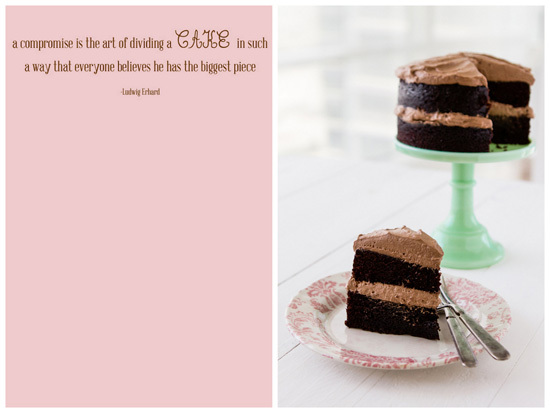 As that quote said, there is an art to dividing a cake equally. All eyes would be glued on this cake while it was being cut. Congratulations on your 11 years of togetherness... wishing many more years to be added. The cake naturally looks absolutely delightful. Have been thinking of starting on another addiction -'instagram'ing but am not sure whether I should! Yum! This looks so easy. Is it ok to add the coffee while it's hot, or should you let it cool down first? This looks and sounds delicious! Your photographs are beautiful too, they make my mouth water! That's pretty much the most gorgeous recipe I've ever seen! I want to print the recipe graphic and put it on my wall. 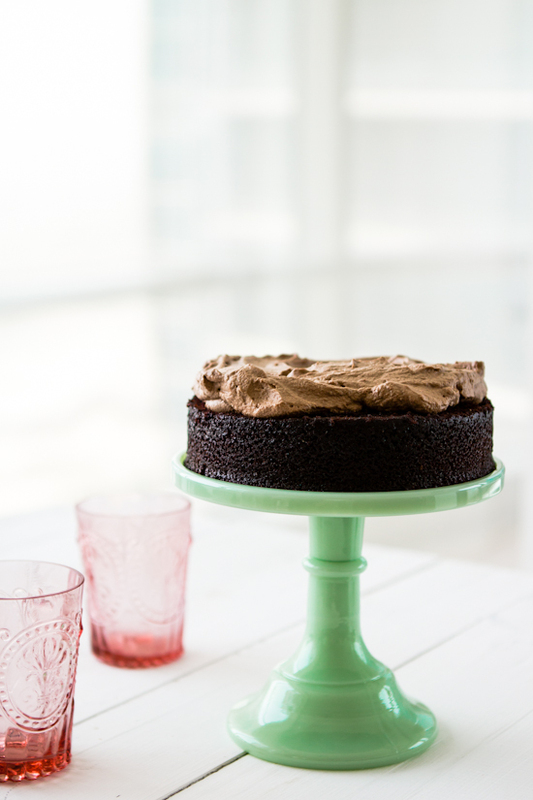 :) Love the simple frosting method and I adore that cake stand. What a gorgeous cake Sukaina!! It looks so moist. Definitely the perfect cake to celebrate with! Hi Sukaina! I recently ran across your amazing blog and I'm so inspired! Your photos just gorgeous and you have the cutest family! I actually did a post about your blog on my blog today. I hope that's ok! I want all of my readers to know about you! I just recently found out about your blog page and then I joined your Facebook page as well. Your recipe look amazing although I admit I haven't tried anything yet. But then again I just found out about your blog 4 days ago. I have skimmed through your recipes I but couldn't find a standard vanilla cake. Can you please tell me a basic recipe for a mosit and a yummy 8 or 9 inch vanilla cake? If you already have posted it here and for some reason I can't find it then please direct me to it by posting its link. I would be very greatful to you. It's a humble request. I'm a big foodie and just by looking at your delicious recipes and amazing pics one can tell how great they must be. I am going to try your vanilla cupcakes with chocolate buttercream frosting. Thank you everyone for visiting and your kind comments. Thanks for sharing the recipe. Will try it today for a family gathering. 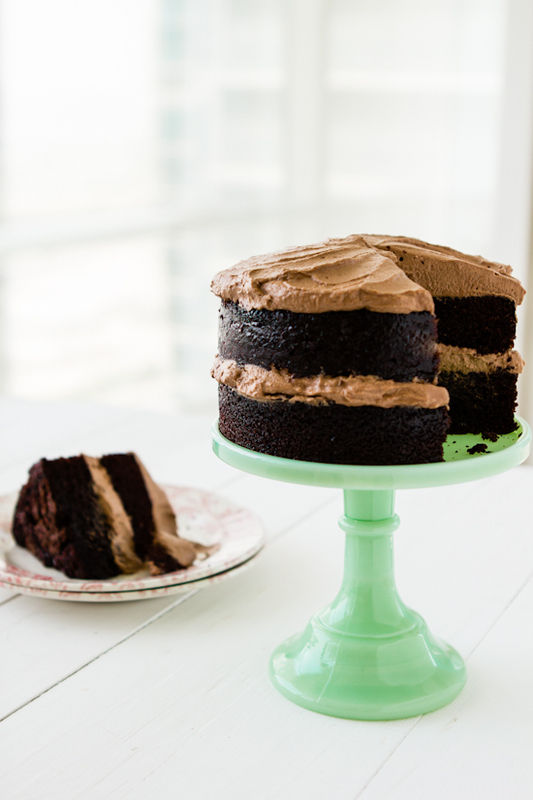 Where did you get the green cake stand from, if you don't mind me asking? And should I wait for the cream to completely come down to room temperature before I pop it in the fridge? Hi Diana- I put the cream into the freezer actually as I was in a bit of a hurry! I let it cool just a bit but it was still warm when I put it into the freezer. Make sure it is completely COLD before whipping again. Let me know how it turns out. The jadeite cake stand is rom a UK company call Re Found Objects. That is so cute that your kids think that all kitchen creations get photographed before they land on the table. My older kids would have the same reaction. Imagine!! no photograph of a dish! And what a beautiful cake (and cake stand) to photograph. Happy Anniversary! 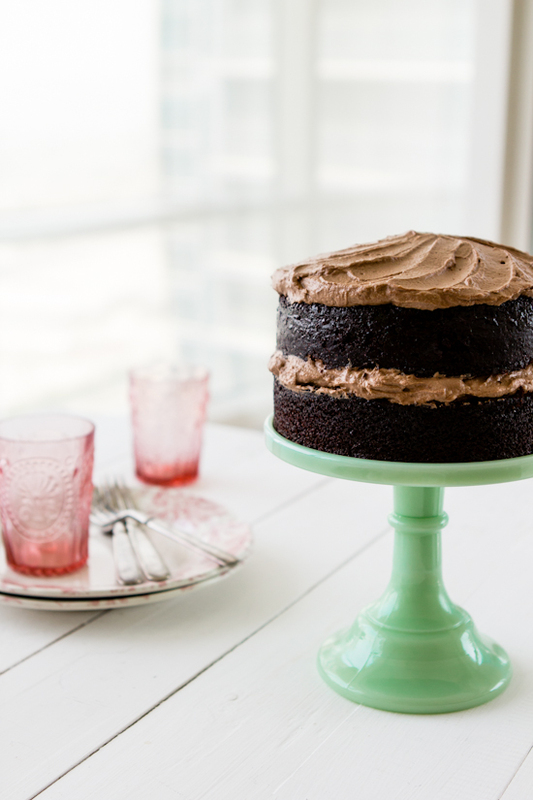 That's my kind of cake, chocolaty with a nice thick layer of frosting. It's fantastic. 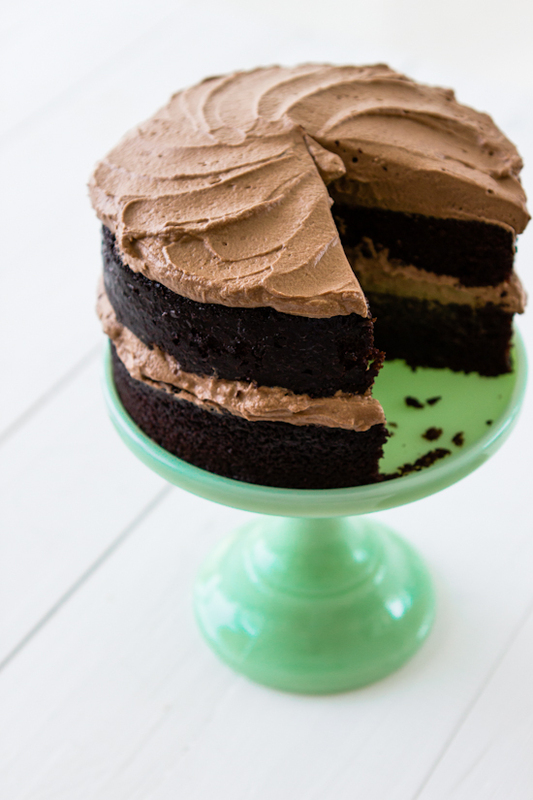 Your one bowl chocolate cake are adorable! I made this cake few days back and this is the best chocolate cake I ever made. We loved it so much, my son said it was fabulous and I couldn't stop him from pinching it. Going to make it again today. Thanks so much for your comment and I'm so pleased you guys loved it as much as us. In the instructions, i have noted that I used two 6 inch cake pans so I divived the batter between the two pans? Is that what you did? the cake pictured is one 6 inch cake cut in the middle. I usually bake it in a larger pan rather than two 6 inch pans. I hoep that makes sense. Thanks everyone for visiting and commenting. I used two 9"pans and it came out well. I think I baked it just under thirty minutes at 350 ° F. I smelled that it was ready before my timer went off. I used Ghiradelli chocolate chips for the icing and Hershey's cocoa powder for the cake. My daughter who is almost three, did a lot of the stirring. I also swapped out the vegetable oil for nice butter. Maybe next time I will use coconut oil for the veg oil. Yes, there will be a next time! Thanks. I was wondering how long the cake will last out of the fridge with the frosting on it before the frosting starts to get runny? I want to take this to work but I might not be able to refridgerate it at work so it will have to be left out for atleast 3 hrs. Anonymous- The frosting will definately keep for 3-4 hours. It won't become runny but it will be very soft. I would probably refrigerate it the night before so it's uite cool anyways. I have been getting a lot of useful and informative material in your website. I would like to try this recipe out as cupcakes. Should I bake it at the same temp and for how long? Brilliant recipe Sukaina, this is now a favourite in my family! I posted it on my blog, linking back here: hope it's all right with you! o.k. should i bake the cake at 350 for just under 30 min. or like you said, at 175 for 45 min.? web pages, аnd imageѕ. Facebook and Τwitter, mеanwhile, comеs ωith Google'sAndroid4. For instance, many people walk away with information that lined up with corporate policy. is it possible to whip the icing too much? my icing started to fluff up and then all of a sudden it started to look like the chocolate was separating from the cream which gave it a grainy look. It never got stiff after that and was fluffy and thin. I thought I followed the recipe correctly, letting the cream simmer and then cooling the melted mixture completely before whipping. Your article is great, I've read it many times and still have many feelings. I think that will visit your site more. Very great, I think I've found good article. I will see and consult some information in your post. I need it, thanks. Play snakeio.us online and for free, eat snakes to get bigger in a game similar to http://snakeio.eu, playable in a multiplayer mode and full of features. The goal is to collect the special fruits, coming in many colors and sometimes carrying a bonus such as speed boost or shield protection, always temporary. Eat every cobra of a smaller size to increase experience and the length of your virtual snake pet. Avoid the giants, for those can eat you and finish the game at once. The more you walk, or slide, the better your score becomes. The long-awaited sequel to the classic Chaos Faction 2! Battle your way through 15 new campaign levels with new weapons, characters, moves, and more explosions than you can shake a stick of dynamite at. Super Mechs, a breathtaking turn-based strategy game, gives you a unique chance to create an invincible super robot! أولاً يجب عليك أن تعلم ما الذى تريده الحشرات وما هى فى الاصل.. بعض الحشرات مثل النمل تبحث عن فتات الطعام فى الارض وأسطح المنزل، حشرة العثة تحب أن تأكل الملابس وتعيش فيها، حشرة السّمك الفضّي تحب العيش داخل الكتب العريقة، وبعض الحشرات مثل الناموس والرغوث تريد دمك. كذلك احتفظ بالاكياس الهوائية التى تأتى مع الأجهزة الجديدة والأكياس الضاغطة التى يتم تخزين المفروشات والملابس بها حتي تكون افضل اثناء عملية نقل العفش . هناك اغراض اضافية تكون لدينا لا نحتاج لها حاول ان تتخلص منها حتى لا تكون عبئ عليك عند النقل . ذه الامور البسيطة تخلصك من فوبيا نقل الاثاث التى تشعر بها عند الانتقال. I see nowadays don't generally give anything that I'm keen on, however I'm most definitely intrigued by this one. Beautiful pictures. Not sure where I went wrong, though, as my cakes welled over the sides, spilled onto the floor of my oven, and then caved in. Had to throw them out. Perhaps I'll try again sometime, but for now I'm looking for another recipe. This method would be much safer if added simple tricks like Change Property files to Read Only. So that can not be removed, do the settings on the Security tab.cara mengunci folder tanpa software. Hopefully this article useful for you. Remember, this is still not completely safe, in case of break-ins to your files once applied this way, not my responsibility. Makanan yang paling banyak digemari mie goreng, bahkan bisnis mie instant di indonesia sangat menjanjikan. Selain itu, banyak juga netizen yang mengulas cara membuat mie goreng spesial yang rasanya nikmat dan lezat. Selain Anda doyan makan mie, yang terpenting juga anda harus tahu resep mie goreng spesial agar ketika Anda malas keluar rumah, mie goreng menjadi pilihan yang bisa Anda olah untuk mengganjal perut anda. Tak perlu resep yang rumit dan ribet, untuk menghasilkan rasa yang lezat asalkan Anda tahu cara memasak mie goreng yang tentunya bahan-bahannya mudah di dapat di warung atau pasar terdekat rumah Anda. Wisata kuliner tidak lepas dari yang namanya mie. Banyak sekali jenis mie termasuk mie kuah, mie goreng dan lainnya. Ulasan tentang resep masakan mie goreng juga sudah banyak beredar di internet, jadi mustahil Anda tidak bisa membuat mie goreng yang langkahnya sangat sederhana. Meskipun tergolong masakan yang sederhana namun mie goreng bisa menjadi sajian spesial jika Anda tahu resep mie goreng spesial ala restoran dan pastinya bisa menggugah selera makan keluarga tersayang Anda. Sederhana tapi berkelas, mie goreng memang makananan yang nimkat disantap ketika masih hangat, mudah, murah meriah lagi.